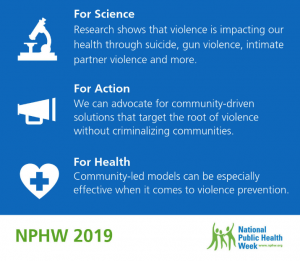 For over 20 years, the first full week of April is National Public Health Week in the United States. Public health was defined in 1920 as “the science and art of preventing disease, prolonging life and promoting human health through organized efforts and informed choices of society, organizations, public and private, communities and individuals.” Analyzing the health of a population and the threats it faces is the basis for public health. Public health professionals work to prevent problems from happening or recurring through implementing educational programs, recommending policies, administering services, and conducting research. Public health also works to limit health disparities by promoting healthcare equity, quality, and accessibility. You can look at public health narrowed down to any population — from a neighborhood, country, or our entire planet. Many factors affect public health, and people are unlikely to be able to directly control those factors. Social and economic environment, as well as physical environment, can be determinate in their quality of health. Higher income and social status are linked to better health, and those in poverty suffer poorer health outcomes. Low levels of educations are linked with poor health, more stress, and lower self-confidence. Whether there is clean air, clean water, safe and healthy homes and workplaces, or even maintained roads and other transportation options, all contribute to the health of the residing community. The presence of support networks, whether they be families, friends, or community resources, all strengthen public health. Cultural customs, traditions, and the beliefs of the family and community all affect health as do genetic inheritances, including the likelihood of developing certain illnesses. Access to affordable healthcare and people’s personal behavior also affect the public health of their community . There are many areas throughout the U.S. that do not have access to clean air or potable water; safe homes, workplaces, or streets. Children are not to blame for their level of education, nor are families who can’t afford to leave an area without access to affordable healthcare or support. A large part of promoting public health is to increase access, improve support of determinant factors and advocate for those who suffer without them. Discrimination and implicit bias affect public health and have been associated with higher rates of psychiatric disorders, substance abuse, and suicide. Experiences of violence and victimization are frequent for people of color, LGBT people, and women and can have long-lasting effects on individuals and their community. Xenophobia contributes to fears of immigrants as carriers of communicable diseases, despite many immigrants coming from countries with higher vaccination rates than those recorded in many parts of the United States. Public health is also affected by the prevalence of other infectious diseases, some that have been eliminated through hygiene and access to healthcare which can spread among homeless populations who have access to neither. 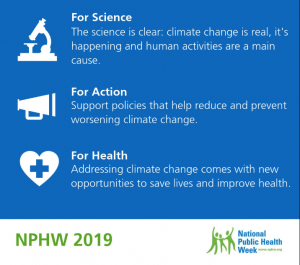 The effects from climate change have a tremendous impact on global public health: worsening chronic illnesses, increasing the spread of mosquito/tick/rodent-borne diseases, disrupting food and water supplies, and increased stress and trauma for people living all over the world. People who are already at risk for poor health due to social and economic factors — poverty, racism, unsafe housing and neighborhoods, and lack of access to quality medical and mental health care — will likely fare worse in a changing climate than those with greater resources. The United States has some unique public health concerns, including gun violence. Before 1996, the Center for Disease Control and Prevention (CDC) was charged with researching gun violence much in the way that the CDC researched deaths from car crashes and the life-saving effects of seatbelts and child car seats. Following a 1993 study that connected gun ownership with a higher risk of being the victim of a homicide by a family member or intimate acquaintance, the National Rifle Association (NRA) responded by lobbying for the elimination for the CDC’s Center for Injury Prevention. While the Center for Injury Prevention remained, the 1996 federal budget included an amendment forbidding the CDC from “advocating or promoting gun control.” While not explicitly barring the research of gun violence, the language of the amendment created an environment where few within the CDC are willing to risk their careers by pushing for research that could reach conclusions that may be misinterpreted as advocating for gun control laws as opposed to fulfilling its mission of advocating for public health. The CDC still ranks gun violence as a leading cause of death in the United States. Americans are more likely to die by an assault with a firearm than riding inside an automobile, and only marginally more likely to die from an accidental gunshot as opposed to being the victim of a mass shooting. Any death by firearm is more likely in the U.S. than the combined risks of drowning, fire and smoke, stabbing, choking on food, airplane crashes, animal attacks, and natural disasters including hurricanes, tornadoes, earthquakes, floods, or lightning strikes. When comparing crime on a whole, the United States has an average amount compared to similar countries; the only outlier in U.S. crime is gun violence. Communities and the United States as a whole can promote public health through education and policy initiatives. NeedyMeds encourages Americans to be active in the legislative process: If you have an opinion on important public health issues in the United States, call 202-224-3121 to reach the U.S. Capitol switchboard; from there you can be connected to your elected House Representative or Senator’s office. You can find contact information for your local representatives by searching your state online. You could also find contact information for your local health department. We at NeedyMeds work in a diverse office with people of varying backgrounds and views. NeedyMeds’ mission is to educate and empower patients in need, with a vision of affordable care for all. It should be clear that our mission is tied inextricably to public health and the endeavor to promote and improve public health systems throughout the United States. The NeedyMeds website has a database of over 17,000 free, low cost, or sliding scale clinics. Search your ZIP code for clinics in your area to find free or low-cost medical attention. There are nearly 6000 free/low-cost clinics listed that offer mental health services. The free NeedyMeds Drug Discount Card can be used by anyone to help save money on their prescribed medication — even over-the-counter medicine — regardless of immigration status. The card is available physically via mail, in a printable form, or as a smartphone app for Apple and Android devices. For more help finding information, call our toll-free helpline Monday-Friday 9am-5pm Eastern Time at 1-800-503-6897.